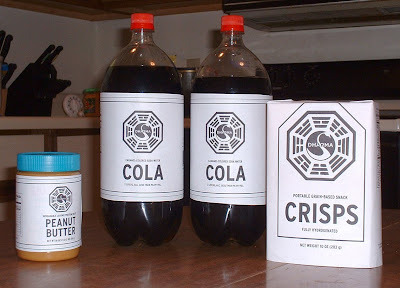 Home » dharma initiative , food , lost , television » LOST: Return of the DHARMA Initiative food labels! LOST: Return of the DHARMA Initiative food labels! We're a little more than 24 hours away from the return of Lost! Want some DHARMA Initiative munchies for your Lost party? Here's the zipped-up collection that I put together a few years ago of a lot of the DHARMA labels that some people have created. And if you want a buttload more DHARMA Initiative stuff you MUST visit Max Pictures' blog 'cuz that dude has made some that I'd never thought of! I love it! I wish I was having a LOST party so I could surprise people with these.